Dehydroabietic acid is an abietane diterpenoid that is abieta-8,11,13-triene substituted at position 18 by a carboxy group. Abietic acid, an abietane diterpenoid, inhibited soybean 5-lipoxygenase with an IC50 of 29.5 ± 1.29 μM. Malotilate is a liver protein metabolism improved compound. Cirsiliol is a potent and selective 5-lipoxygenase inhibitor and a competitive low affinity benzodiazepine receptor ligand. Indirubin-3'-monoxime is a potent GSK-3β inhibitor, and a less potent inhibitor of 5-Lipoxygenase, with IC50s of 22 nM and 7.8-10 µM, respectively; also shows inhibitory activities against CDK5/p25 and CDK1/cyclin B, with IC50s of 100 and 180 nM. Nordihydroguaiaretic acid is a 5-lipoxygenase (5LOX) (IC50=8±3 μM) and tyrosine kinase inhibitor. ML355 is a potent and selective inhibitor of human 12-lipoxygenase. 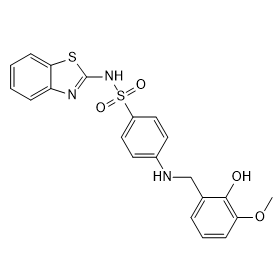 U-73122 is an inhibitor of phospholipase C, phospholipase A2, and 5-LO (5-lipoxygenase). Zileuton(N-1(1-benzo[b]thien-2-ylethyl)-N-hydroxyurea, A-64077) is a selective and potent 5-LO inhibitor, and thus inhibits leukotrienes (LTB4, LTC4, LTD4, and LTE4) formation.